Twin sisters Frani, top photo, and Cati LeVan, bottom, of Triad High School have been selected to compete in the Bill Moss Underclassmen all-star basketball game in March. The game will feature the top girls’ hoop underclassmen in southwestern Ohio. Triad High School’s twin basketball players have earned a post-season honor during their sophomore season. Twins Cati and Frani LeVan have been selected to play in the fourth annual Bill Moss Memorial Dayton Underclass All-Star Game. The contest is scheduled to be played Wednesday, March 20, 6:30 p.m. on the campus of Edison State College in Piqua. The event will feature top underclass girls basketball players from southwest Ohio. They were selected by Jim Dabbelt, who is a nationally-known girls basketball writer and author of The Dabbelt Report, which is considered the state’s premiere girls basketball media source. Previously known as the Dayton Underclass All Star Game, the event was renamed last year to honor longtime Urbana High School girls basketball coach Bill Moss, who died in December of 2017. Triad head coach Jeff Merklin said the sisters are very important to his program. “They mean more than just basketball to our program,” he said. “Cati and Frani are quality young women who do very well in school and are wonderful teammates. Through 13 contests this season, Cati LeVan is averaging 15 points-per-game as the Lady Cardinals’ leading scorer. Sister Frani is not far behind in scoring at 12.8 and “quarterbacks” Triad’s offense with 2.5 assists per contest. They will join a host of underclass girls basketball players who have already committed to play in the all-star game. Those players include Ivy Wolfe of Minster, Kenzie Hoelscher of Fort Loramie, Kenna Gray of Tipp City Bethel and Corina Conley of Pitsburg Franklin Monroe. The sisters earned their first varsity letters a year ago as freshmen. During that campaign, when the Lady Cardinals won 12 contests, Cati LeVan averaged eight points per game and Frani chipped in with 4.8. 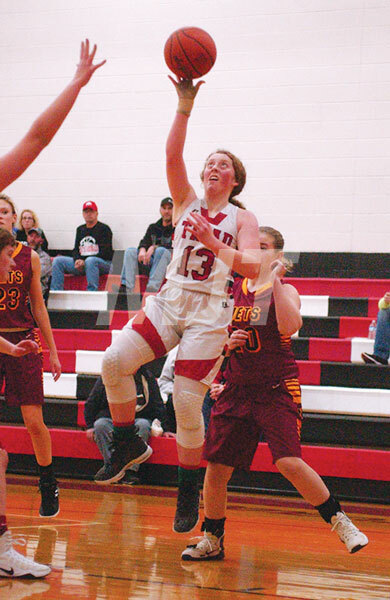 With the graduation of Alea Ferguson and a one-year stay by foreign exchange student Emma Vanninen, the twins have stepped up to lead the Lady Cardinal offense. While Merklin is pleased for the sisters’ current honor, he also hopes the accolades will help the Triad program in future years. “Our numbers in the girls program, from youth on up to high school, are down,” he said. “I really hope that something like this will stir interest among the younger girl athletes at Triad.